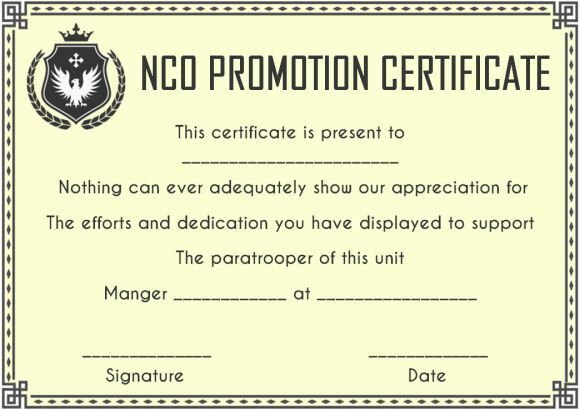 In general, a promotion certificate template can be used by every school, college, and all organization that prefers to encourage the good work and announces their movement from one level to another. Use these templates for free and recognize the excellent work of your people. The gesture of identifying a good work in the organization is the key to motivate employees to be more productive. Apart from appreciating with rewards issue a promotion certificate to announce that the individual to elevated to the next level for his/her excellent This will make others also to work hard to reach the next level. 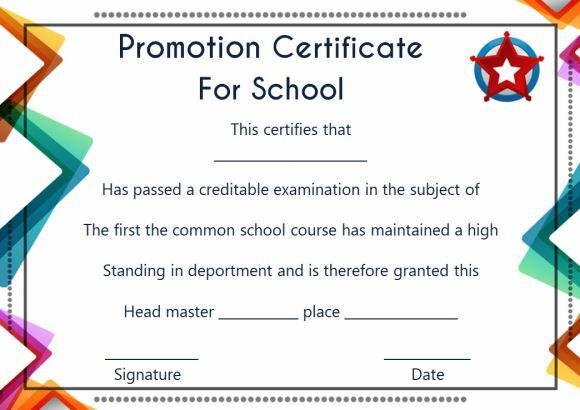 In schools promotion certificate makes children happy that they have passed one grade and eligible to move to the next level. Even in colleges, the concept of promotion certificate can be used. Yes, till the official graduation certificate is given, the institutions can provide promotion certificate, and that will help students to find a job in the market or to apply for higher studies. Army officials often look at some appreciation for their sacrifice to the nation. They can be awarded promotion certificate, and that will make them feel proud. 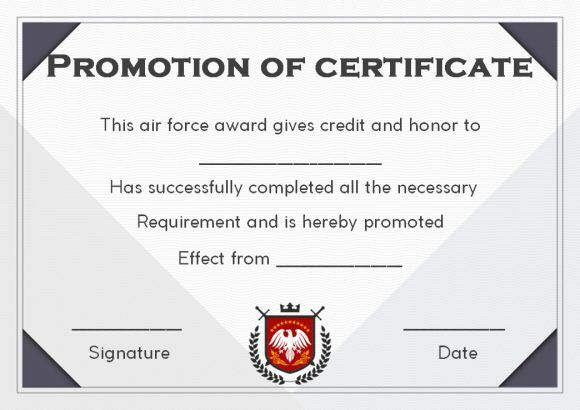 Promotion certificate is not an official document and can be downloaded for free from this site and still make the recipient feel glad, responsible, and also motivates. It is mentioned about the benefits of promotion certificate in various walks of life. One can find a different kind of promotion certificate template used for multiple purposes. Find the classification of promotion certificate templates and their use. Name of the Establishment that issues the promotion certificate – Typically fill your concern name in this place. 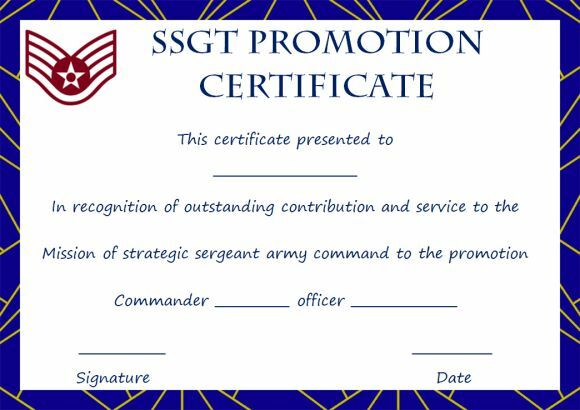 Recipient Name – the name of the receiver who stands eligible for the promotion. Details – Mention the particulars like promoted from class 6 to 7. Promoted as Manager in recognition with the continuous good work as a Team lead for three years etc. You can write any detail in this relevant to the promotion given. Date when the certificate is given. Signature – Sign of the authority with the establishment seal. You can find many designs in this section, and all you need to do is download the template to your system. Open in edit mode and type the required details. Save and print it on a certificate paper for honoring the individual. 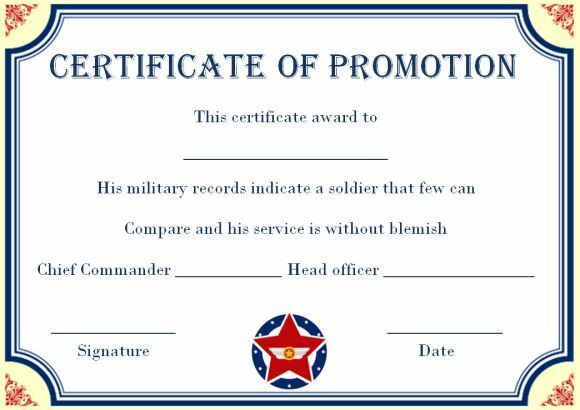 These are certificates available for print to recognize the best efforts of the army officials. 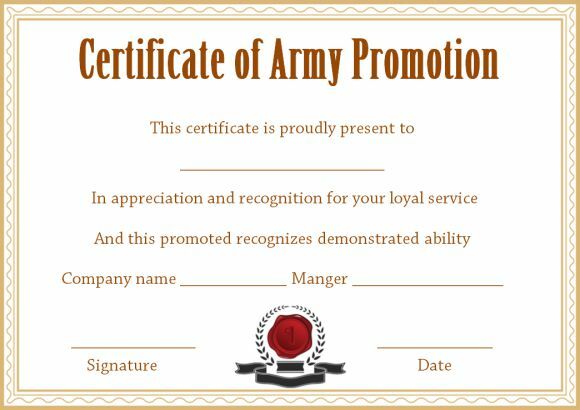 Army officer promotion certificate comes in different ranking, and you need to be careful when you choose the templates from. You can also choose any template and edit the correct ranking details. For instance, the person is promoted from E2 to O6. The order is enlisted officer in the lower level cadre with E2 to E9. Next comes the WO grade called warrant officer. It begins at WO 1 to 5. The commissioned officer comes next beginning with O1, and there are ranking till O6. You must know the correct ranking to fill the details including the name of the official and the date. 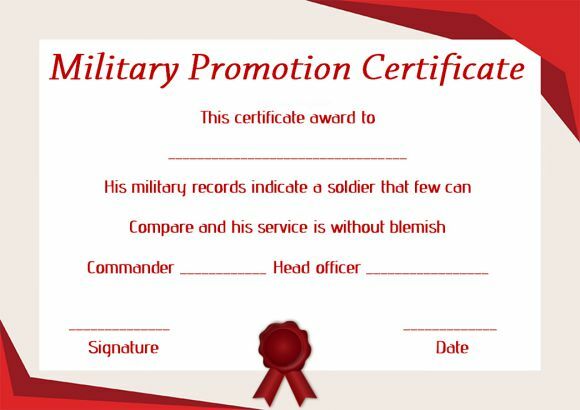 Also, the army promotion certificates were given here can be printed on a 32 lb parchment paper. The dimension used in 8.5 x 11. 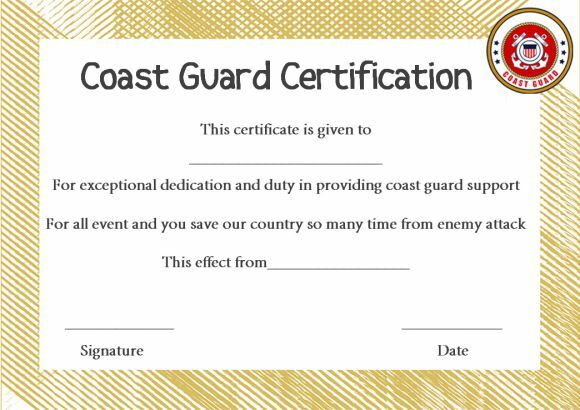 These certificates are not official and are provided to remember the military services. The promotion certificates given to kids are for fun. To make them feel happy. Also, to emphasize the importance of education. Yes, all through the year they will study hard to get promoted to the next class. 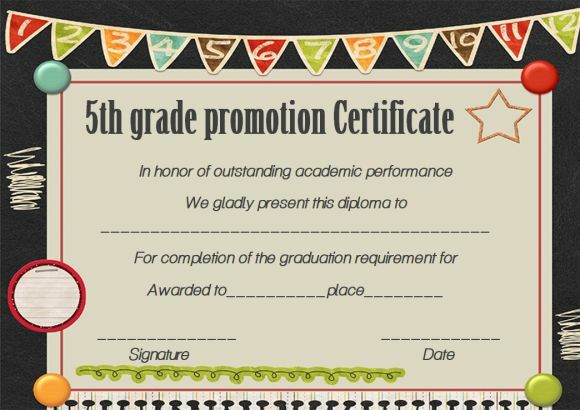 You can find many promotion certificates for kids in different colors and themes. Use these templates to save your time. 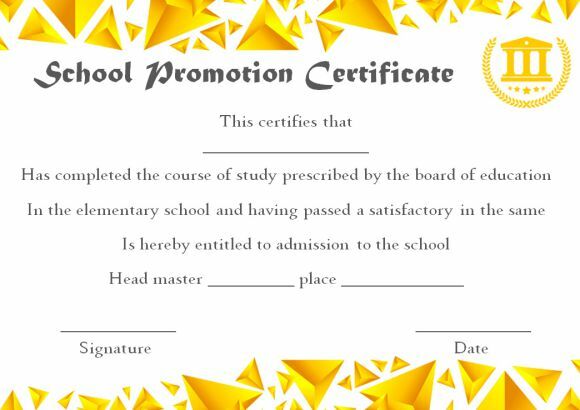 Especially preschool kids can get a thrilling experience when you give them a promotion certificate. 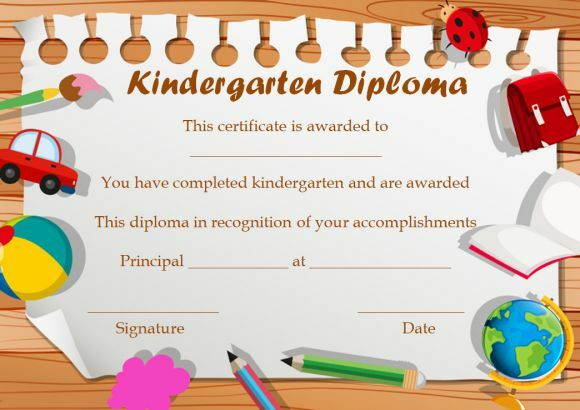 You can give these certificates in the name of KG graduation certificate or any other name based on your creativity. 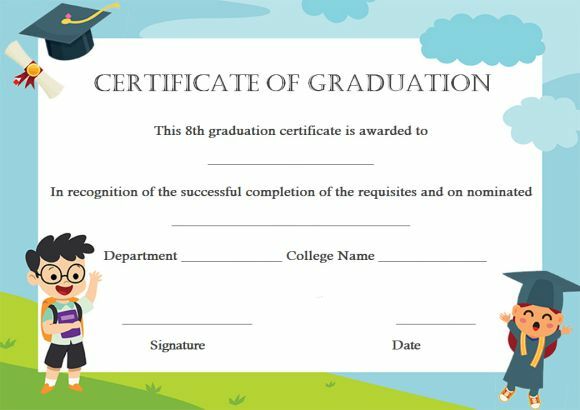 It is effortless to edit these certificates using the word, and you can even add images like balloons, graduation hats, etc. 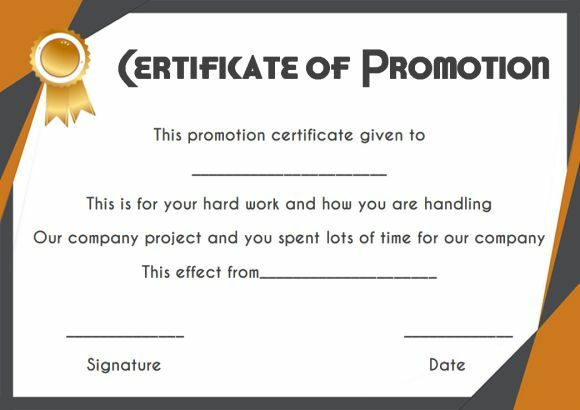 Promotion certificates are critical motivators to employees. Every employee work for credit in one form or another. Sometimes monetary rewards and appreciations motivate them. But nothing can motivate than a promotion. Promotion cannot be given to all and company must define set of conditions and employees must be aware of the same to work towards achieving the next level. Do not make this scale readily achievable and raise the bar based on the capacity of the individual to get the best out of every employee. Also, that will challenge the employees to get to the next level. 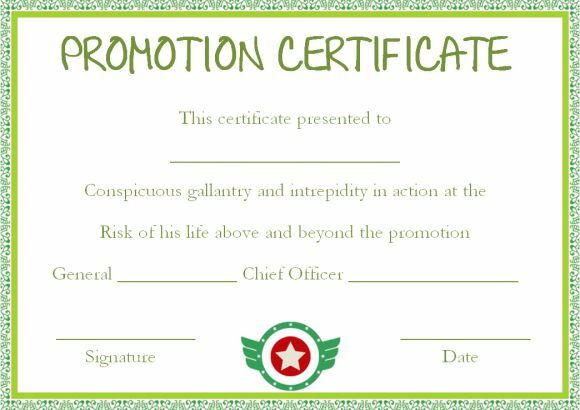 Promotion certificate once given cannot be revoked as it is a change in position and hence company must take additional care to define the set of rules. It is equally important to define rules based on the level and lower level might have more straightforward control than higher level as organization structure is a pyramid-shaped one. A number of employees will be less in top level but with fierce competition. Upon following these pointers company can ensure identifying the right employee to receive the promotion certificate. 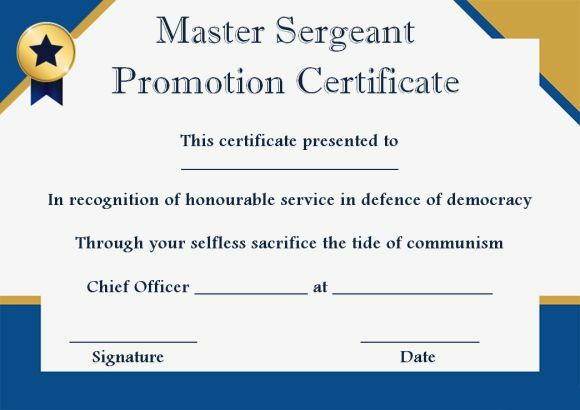 Apart from the usual work-related promotion, there are few individual promotion certificates given primarily in the army which are listed below. Attaining Noncommissioned Officer Position needs a lot of education and experience. 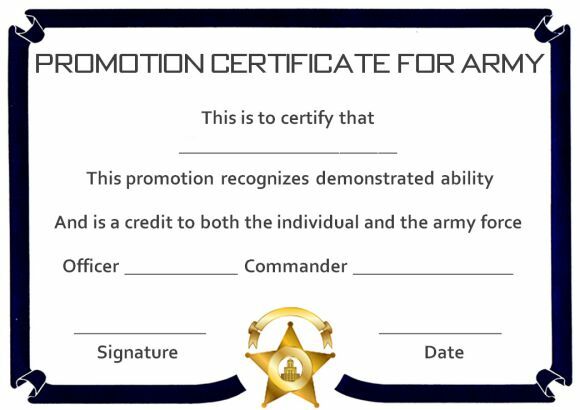 One must indeed be recognized with a promotion certificate to announce to the whole army about their contribution. Proper English skills to write is the critical skill looked at for NCO promotion. 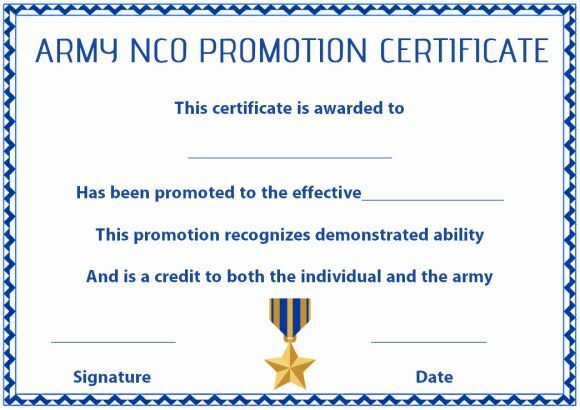 Leadership skill and team working ability is the next skill identified in an individual for attaining NCO promotion. Commissioned officers outrank the warrant officers. Warrant officers come next level to the enlisted officers. They need not be a graduate but still eligible to get promoted as a warrant officer. Apart from the qualification obtained from education warrant officer deserves the same respect an as NCO officer. 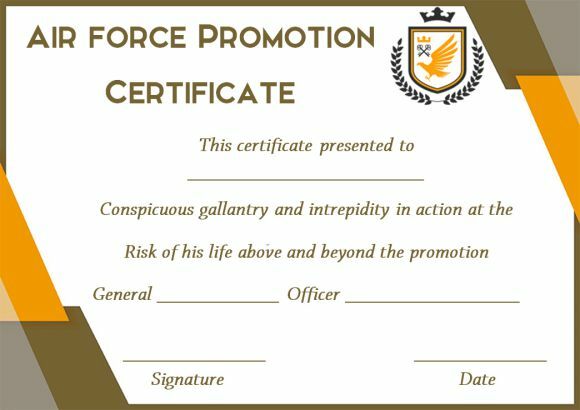 Use these Warrant officer Promotion certificate to elevate your enlisted officers to WO 1. Coast guard officials carry out periodical patrols and maintain the Offshore Development Areas and ensure the maritime law is observed. Also, they take care of the safety and security. They work closely with fisherman to protect them from against any illegal attack by other nationals. These officers are given promotion based on their education, experience, and performance. Use the templates provided here to recognize their excellent work. The word “Promotion” means encouragement, advertisement, support, etc. 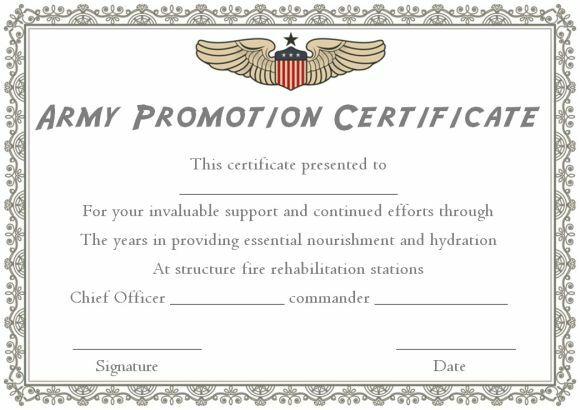 Promotion certificate is a certificate given to acknowledge the excellent work of an individual. In simple words to make you understand, just imagine when you were a kid you might have studied in 1st grade and move to 2nd grade. Yes, you got promoted from one class to another class. In schools, your parents might have got a letter stating that you got encouraged. This is precisely what will be mentioned in a promotion certificate. 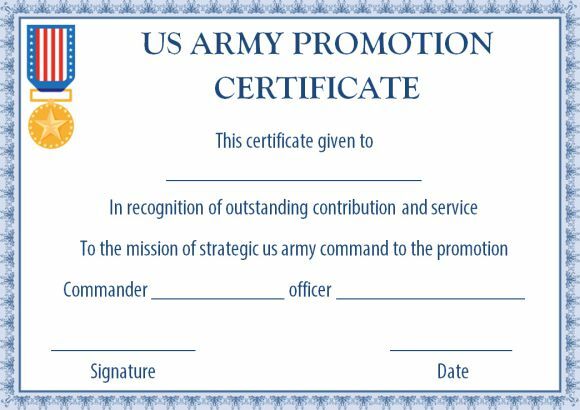 The purpose of the promotion certificate template offer is to help every establishment to download the free templates and edit them for their perusal. Feel free to visit any our site any number of time to recognize your employees, students, or army official’s good work by promoting them to higher levels.